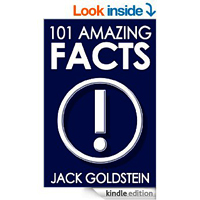 101 Amazing Facts - Did you know that Shakespeare wrote the world’s first ever knock knock joke? How much of a ribbon worm’s own body can it eat and still survive if it gets a little hungry? What unusual lost property has been handed in on the London Underground? And what surprising kind of song is the American national anthem based on? This absolutely fascinating book contains over one hundred facts covering various categories such as war, music, TV & film, ancient civilizations, royalty and many more. So whether you want to know which pirate ate a man’s beating heart, or what Lennon and McCartney’s unfinished play was called, then this is the book for you.